Speaking of militant suffragettism, the centenary of the Vote brings an interesting little display at the National Portrait Gallery, itself on the receiving end at the time. In July 1914 suffragette Anne Hunt took out a butcher’s cleaver and proceeded to remove three slices from Sir John Everett Millais’ portrait of the suitably miserable looking Sir Thomas Carlyle, philosopher, misogynist, apologist for slavery and proto-fascist. Sir John’s pre-Raphaelite vision had long since bitten the dust, and one can only regret that Hunt wasn’t also able to take a chunk out of Millais’ “Bubbles”. A photo, in the NPG’s display, of the canvas “as damaged by Suffragette”, taken in the aftermath, shows clearly three substantial cuts across Carlyle’s pate; Hunt certainly had good aim. The painting itself, a piece of dark brown pomposity that my Grandma would have loved, is, unfortunately, still in the Victorian Gallery, annoyingly restored. Among other fascinating pieces in the display is a Scotland Yard circular to art galleries with details and surveillance photos of two other women with a record in iconoclasm, one being Mary Richardson, who had taken a “chopper” to the backside of Velazquez’s “Rokeby Venus” at the National. There’s a particularly good page on all this at the NPG website, by their archivist Bryony Millan. Recommended. 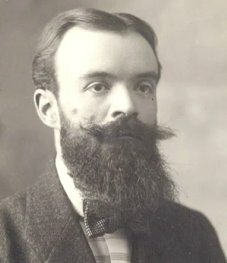 Mary Richardson, along with a number of other ex-suffragettes, later joined the British Union of Fascists, with whom Lewis briefly flirted at one point. And we all know about Pound and Mussolini. Carlyle, exponent of the “Great Man” theory of political history, seems to have had the last laugh in all this. Well, you can’t have everything. As well as interesting marginalia, a bonus of buying second hand books is finding unexpected stuff tucked between pages, so I was chuffed recently on acquiring a set of the early ‘fifties poetry review Nine to find various fliers and cuttings hidden within, plus three letters to the original owner of the magazines from the classical scholar, translator and academic W F Jackson Knight (brother of literary critic Wilson Knight). 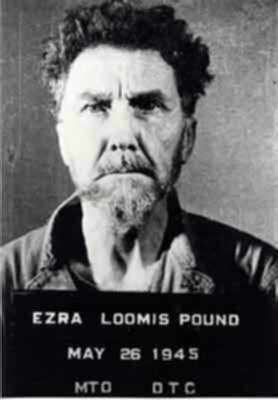 One of these throws an interesting light on the methods of Nine and of its pugnacious and reactionary editor, the poet and self-appointed disciple of Ezra Pound, Peter Russell. 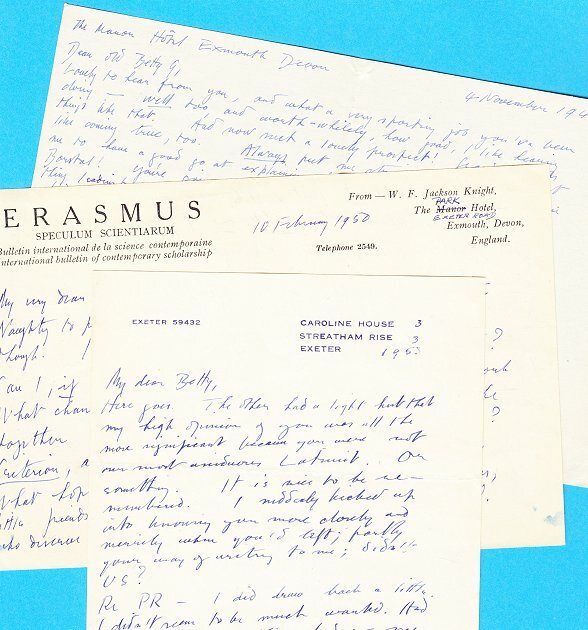 The letters are to a “Betty”, probably an ex-student of Jackson Knight’s (though not, as I first thought, the classicist Betty Radice, later an editor at Penguin Classics). 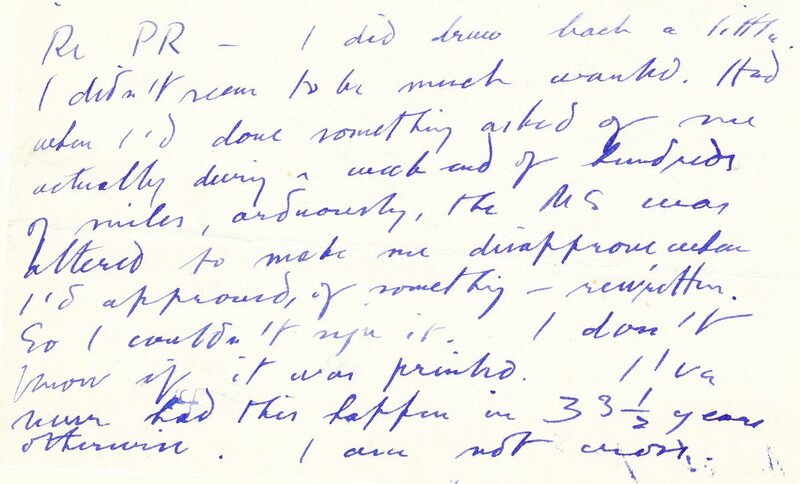 “JK”, as he signed himself, maintained a vast correspondence with ex-students and others, so it’s annoying but hardly surprising that my unidentified Betty makes no appearance in Wilson Knight’s exhaustive and exhausting 1975 biography of his brother, which I now plan to employ as a doorstop or flower press. “Naughty to put a letter in for 1d! How I liked it though. I wishd you were here. JK’s letters, wrote Wilson Knight, “drive the informality of epistolary writing to the limit.” No doubt Jackson Knight wrote as he spoke; it’s always a slight shock to realise that some people of a certain class really did talk like this. The Wind and the Rain, a rival literary review run by Neville Braybrooke, had recently printed a piece by Jackson Knight on his favourite author, Virgil. He did indeed go on to subscribe to Nine, to which he was also to make a single ill fortuned contribution. So was Nine to prove the right sort of mag, serving the right causes, and run by the right sort of people? Well, it was “right” in one sense. 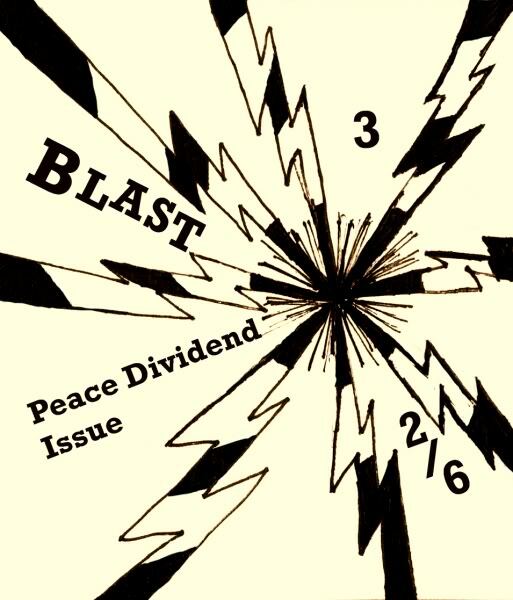 “The Right is to-day, everywhere the Underground Resistance!” shouted Peter Russell in issue 2 of Nine. 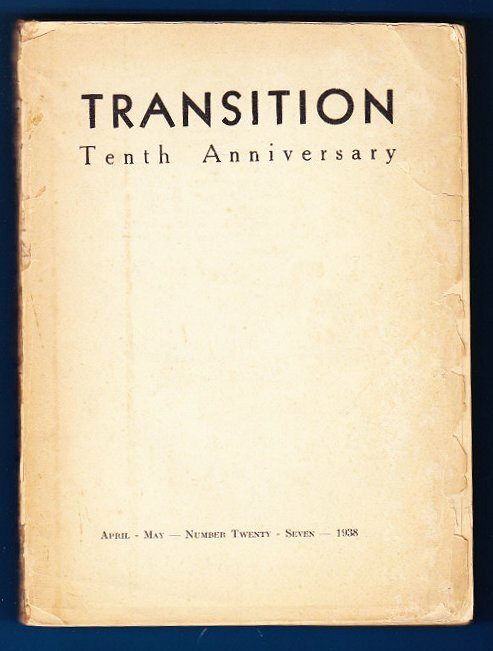 Reacting to what they saw as a poetic decade of undisciplined and introverted Leftist neo-romanticism, Russell and his editorial board – poets G S Fraser and Iain (later Ian) Fletcher, editor and classical translator Ian Scott-Kilvert and classical critic D S Carne-Ross, afterwards a Third Programme producer – banged the drum for a return to objectivity, order, tradition and form. In this post-war re-invigoration of the great literary tradition, translations from the Classics were to play their part. 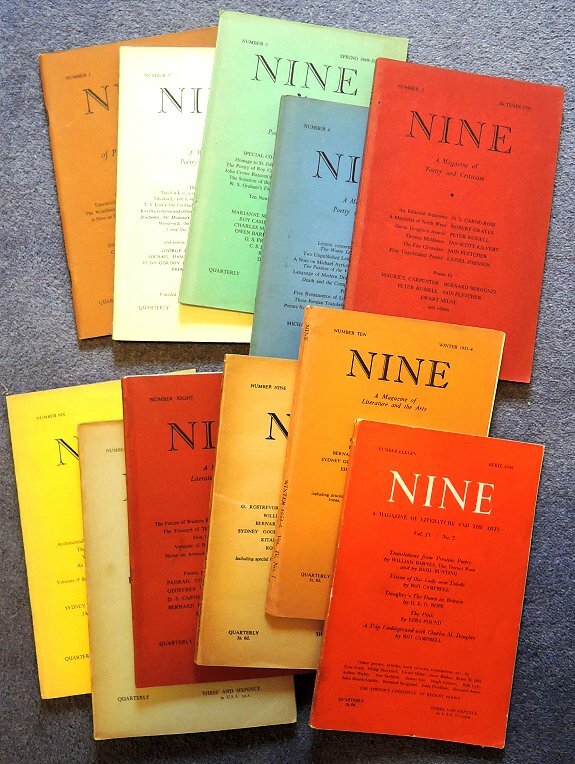 Even so, Nine was happy to print poems by Charles Madge, Ronald Duncan, George Barker and others positioned well outside its programme, though it was not always an unstrained fraternisation. For Russell, if not for his co-editors, these literary standards were of a piece with his maverick political rightism. In the event, it wasn’t too long before the wheels fell off. 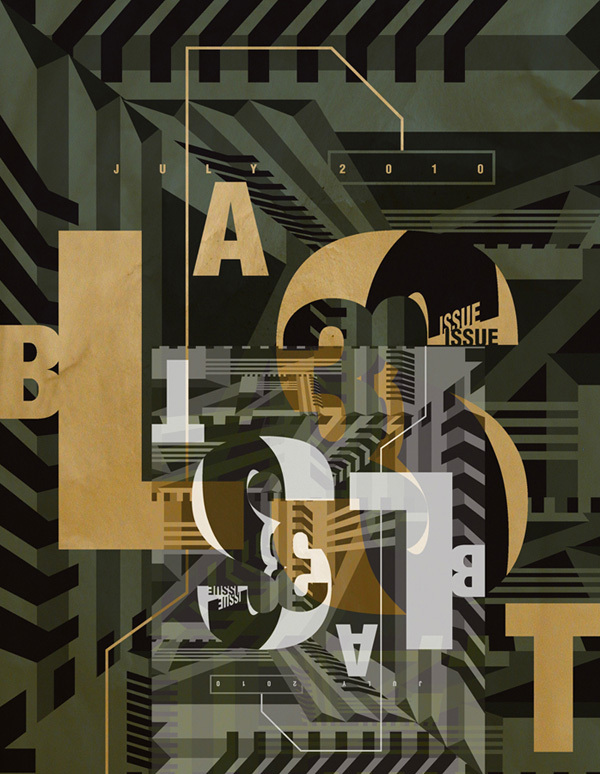 Issue 1 of Nine had appeared in the Autumn of 1949. Oddly, all but one of the editorial board vanished abruptly from the title page after issue 7 of Autumn 1951, leaving Russell to manage the final four issues solo. What happened? This “offensive review”, of J B Trend’s translations from the Spanish of poems by Juan Ramon Jimenez, eventually appeared in Nine 9, with a note by Russell explaining that it had been rejected by “the then editorial board”, and first printed in The Catacomb, the scurrilously reactionary (and loss-making) review run by Campbell and his son-in-law Rob Lyle, but bailed out by Tate and Lyle sugar money – “catacombs financed by saccharine,” as Christopher Logue put it. 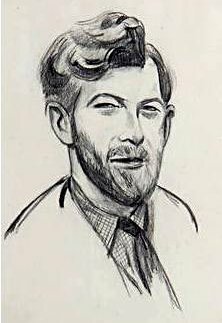 “Though it is difficult to imagine what literary motive can have prompted the publication of this book,” fumes Campbell, “the political motive sticks out a mile.” His “review” then veers off into the familiar Campbell rant about the Spanish Civil War, “gun-shy poets” such as Auden and Day Lewis, the Iron Curtain and so on. It’s not hard to see why the board had cold feet. 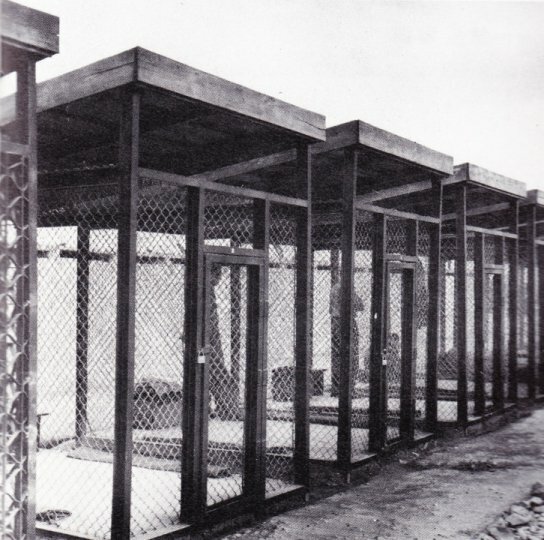 On top of all this Russell’s co-editors, their suspicions aroused by an unpaid printer’s bill, had accused him of having his hand in the till, while a fire destroyed the contents of Nine’s office in 1951, postponing issue 7. Thereafter frequent appeals for renewals of subscriptions couldn’t prevent disastrous delays to later numbers. Nine finally gave up the ghost in April 1956. Of the Virgil, “Classicus”/Jackson Knight approves most warmly: “ … as felicitous as any modern English prose version .. can be expected to be … The most fastidious reader … will find nothing to blame.” And “Classicus” even heads off the predictable charge of dumbing down: “If this is ‘culture for the masses’ – and I think it is – we must have more and more of it …” All the other books are thoroughly approved, except for one, Rieu’s Iliad. 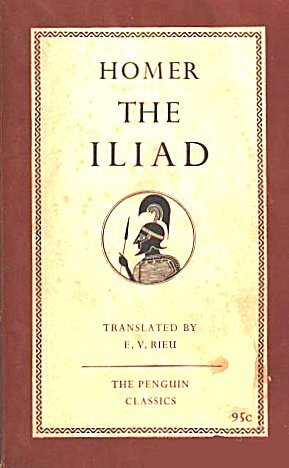 Here his opinion appears inconsistently damning: “Homer is eminently rapid, eminently plain and direct, and eminently noble … Dr Rieu’s prose Iliad satisfies the first two conditions … but fails to satisfy the third. Of the supreme grandeur of his original he manages to convey very little …” And that’s about all “Classicus” has to say on the book. This has to be the section altered by Russell to censor Knight’s original, more generous approval of Rieu’s Iliad. But why? Rieu … translated Homer in an egalitarian spirit, in line with a trend which was gaining ground in the aftermath of the Second World War. To bring Homer to the widest possible range of readers, Rieu chose to transform his epics into novels … emphasising narratives and characters … his Odyssey, in particular, was a major landmark in popularising the Classics: the huge success of Rieu’s Penguin edition proved that Homer could be made accessible to anyone. Popularised perhaps, but hardly popular with Peter Russell. In a stand-off between accessibility and “grandeur,” his elitist instincts knew no doubts. 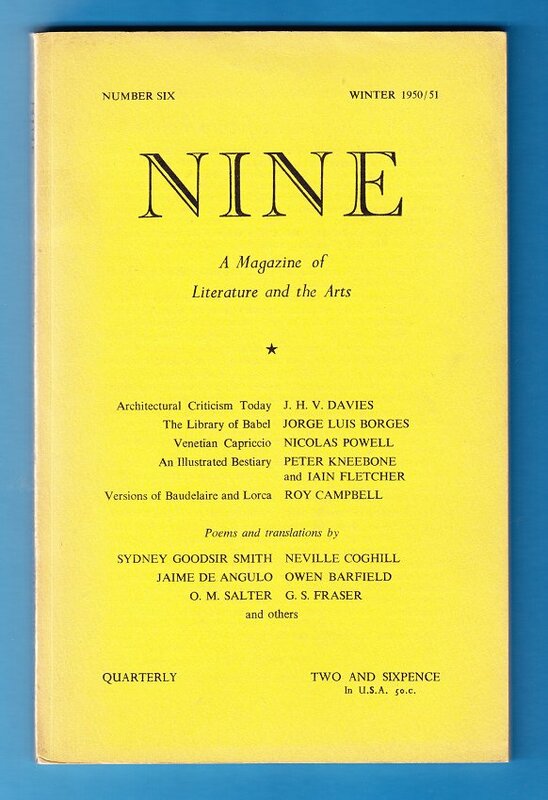 The issue of Nine that carried the censored review by “Classicus” also promised forthcoming numbers on Latin and Greek literature, “to re-establish creative contact with the past.” Translations were solicited that should not “sacrifice poetic vitality to accuracy, nor accuracy to poetic vitality.” For Russell, Rieu’s egalitarian translations met neither criterion. In the event these special numbers did not materialise; in humiliating Jackson Knight by tinkering politically with his review, Russell made sure of that. But we are in Cold War territory here. And the fracture lines of the times were as liable to appear in the pages of the little magazines as anywhere else, as this minor classical spat demonstrates. 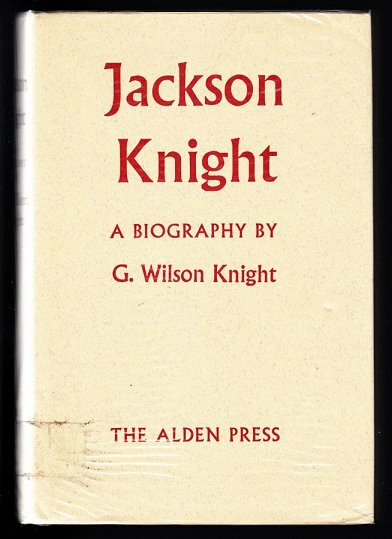 Jackson Knight died in 1964, his reputation as a scholar and a gent unblemished, apart from an enthusiasm for spiritualism that led him to consult the shade of Virgil himself to advise on his 1956 Penguin translation of The Aeneid, the “Supreme Poet” even dictating answers to JK’s questions directly in Latin to his medium Theo Haarhoff; in séances Virgil appeared to Haarhoff’s niece clad in his laurel crown. Peter Russell died in 2003 after a long, hugely prolific and generally penniless career as a professional poet. 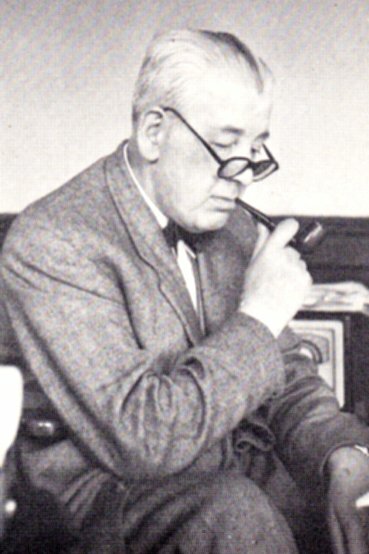 His later work, under the influence of his “mentor” Kathleen Raine, moved away from the vaunted objectivism of the Nine years to a gushy, “vitalist” and often confessional Neoplatonism. 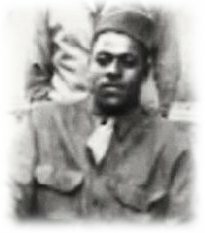 His anticommunism never wavered. 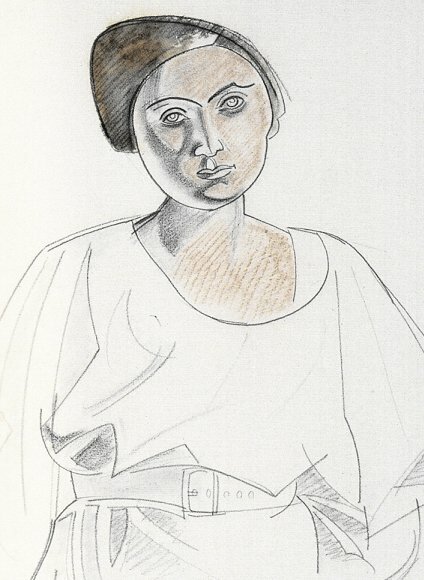 Following on from my page of images by Jessie (later Jessica) Dismorr, Vorticist painter, poet and flâneuse, a new bunch of drop-down pages is available among the tabs up above (or go here and find the links) on her writings from 1915 to 1922. 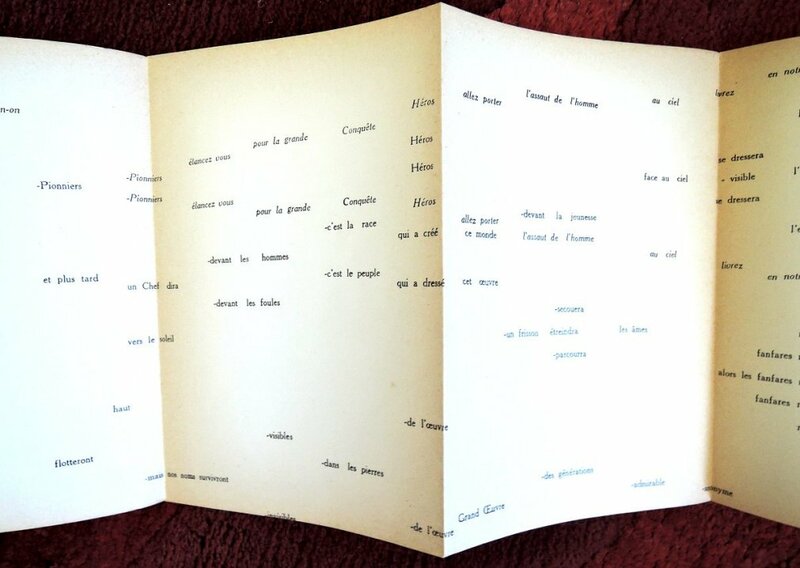 Here are collected all her pieces from Blast 2 of 1915, from The Little Review of 1918-19, and from the manuscript poetry collection of 1918 given to John Storrs, with her piece on Russian art for The Tyro 2 of 1922, preceded by a general introduction. Maybe someone else has done this far better, or is about to, but I’m not aware of it, so here’s my best shot. From the psychogeography of “June Night” to the dense and breathless metaphysics of the later poems, from aphorisms on aesthetics to feminist satires on the Pre-Raphaelite woman, there is much of interest here, not forgetting the savage attacks on Dismorr in The Little Review by Margaret Anderson and Yvor Winters that knocked the stuffing out of her literary self-confidence. “To Strangers – all my curiosity and artlessness. To my Lovers – an eternal regret. In contrast, much online comment on this phase of Pound’s life seems to be solemn hagiography hosted by Odinists, conspiracy theorists or New Righters (read: old fascists), and one hesitates to add to it; but then, his case is so instructive. So here’s a piece of verse concerned with our urge to reconstruct or re-enact the past, a project that must always fall short. It starts in a museum of military costume and ends at the Cannock Chase German war cemetery. Ezra makes a guest appearance along the way. those lapels are buttoned all awry. the moment’s mores made a subtle song. a tic that tells its time. must shamefully betray the moment of its making. 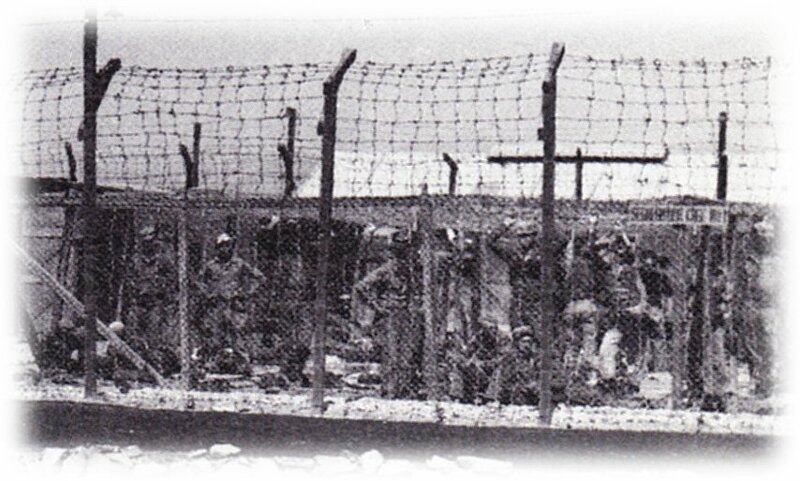 its shamming history is softly written. (or was it ‘cassimere’?) provokes resentment. Ghosts are not amused by our uncaring parodies. they gob their anger at our future features. an turn it into goddam panto. to reinviggerate within a Canto. capsizing on his river of mysterious dead. The tiny birds perch out of view. We hear their sorry bleat, and peer but can’t identify. the dead are all and always very far from home. 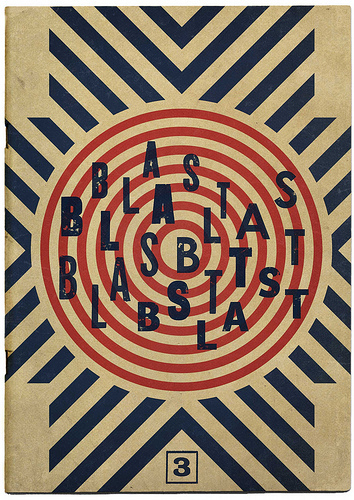 While I’m in the business of blessing Blast, a short thought or two about the “lost” number three of the Vorticist mag. 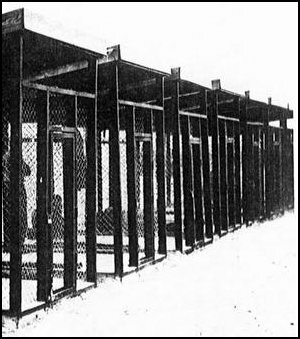 “I think your idea of … the launching of a fresh number of Blast, which you could call an American Number, is an excellent notion,” Wyndham Lewis wrote from his army training camp at Weymouth to Ezra Pound in late April 1916. “You would have to conduct it largely, I expect. 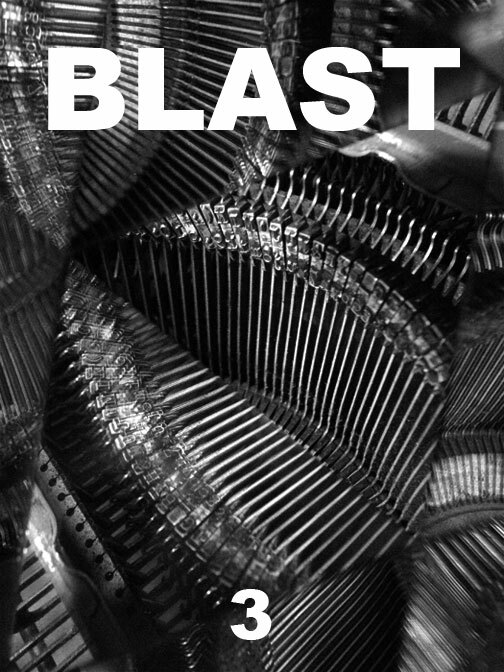 I personally should be very pleased to see Blast do another lap.” As Lewis envisaged it, the contents of a third number might have included “a drawing or two & a little writing” of his own, reproductions of works shown at the Vorticist group show in New York (including one in colour), Pound’s Byronic satire “L’Homme Moyen Sensuel” (which eventually appeared in the Little Review in 1917), and a contribution of some sort by Eliot. In the event there was of course no third lap, though the “American Number” was eventually reanimated, after a fashion, as the hefty mish-mash of academic criticism, modern creative writing and associated bits and bobs put out in 1984 as Blast 3 by diehard Lewis re-publishers Black Sparrow Press of California. Lots of fun, but, inevitably, not kwite the bisnez, as Ezra might have put it. 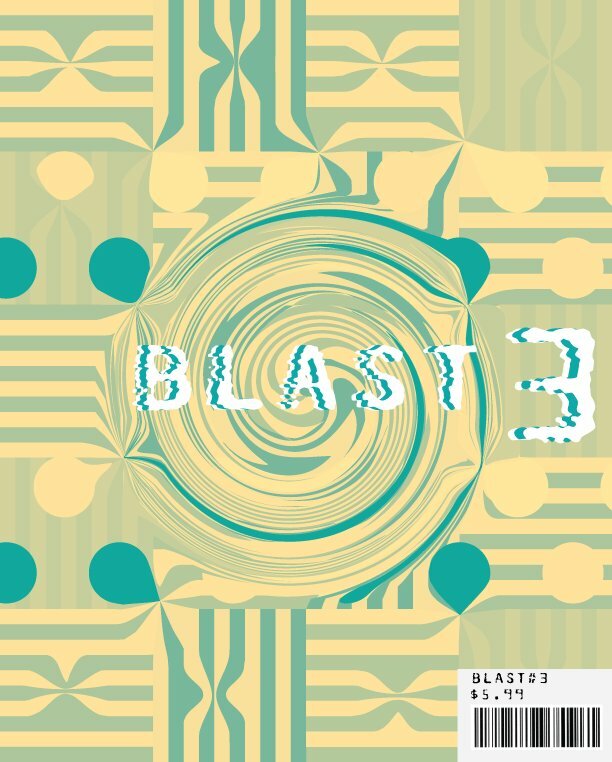 I’m surprised that there haven’t been countless other attempts at a Blast 3, if only at the cover. Or have there? All I can find is a Blast 3 cover “remake” thread from 2010 at the “Whitechapel” website run by “Freakangels” webcomic creator Warren Ellis. There are five pages of entries from various digitty-comicky-graphicky people, though few of them really hit the mark, to be honest. But here’s a half dozen that I felt made a real attempt to be true to the spirit of the original while dragging it a few decades into an alternative future; the low-tech design of the first two seems particularly apposite. 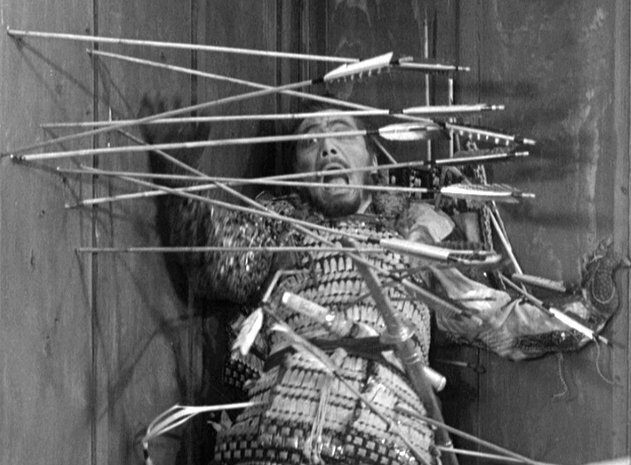 Though at the end of the day, this sort of thing doesn’t amount to much more than deco-punk game-play. As steampunk subsides comfortably into commercial neo-Victorian whimsy, the modernist era might appear to offer an edgier source for retro-futurism. Having said that, the Tate Vorticist show last summer was flagged up here for the dieselpunk community, but apparently with little interest; in these circles, film noir cosplay, vintage vehicles or closet stormtrooperdom seem a bigger pull than modernist art. But pickiness about the real culture of the fetishised past might actually indicate a developing boredom with it – hence, our mash-up version of the ‘thirties or whenever is expected to be more interesting than the real thing. Besides being a convenient laziness, a refusal to engage for real. In our parodic, superficial, postmodern charades we really are becoming The Dancers at the End of Time.